What Day Of The Week Was September 20, 2000? 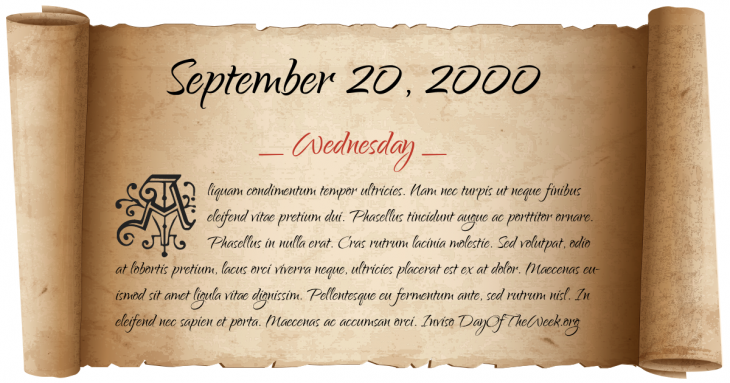 September 20, 2000 was the 264th day of the year 2000 in the Gregorian calendar. There were 102 days remaining until the end of the year. The day of the week was Wednesday. A person born on this day will be 18 years old today. If that same person saved a Cent every day starting at age 4, then by now that person has accumulated $53.26 today. Here’s the September 2000 calendar. You can also browse the full year monthly 2000 calendar. The British MI6 Secret Intelligence Service building is attacked by unapprehended forces using a Russian-built RPG-22 anti-tank missile.